The same year The Conversation came out, another Francis Ford Coppola film did: The Godfather Part II. More people have probably seen and heard of The Godfather Part II than The Conversation, but The Conversation ranks in the same field as The Godfather Part II. And that’s saying something, seeing how both parts one and two of The Godfather are my favorite films of all time. 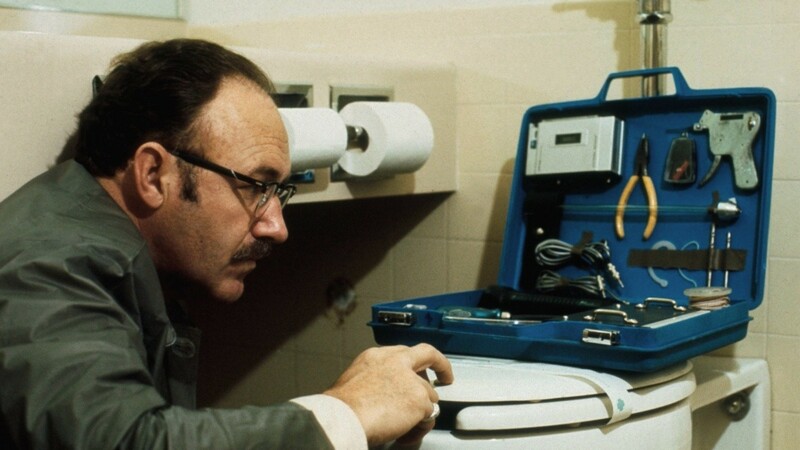 The film revolves around Harry Caul (Gene Hackman), a brilliant surveillance man set up to record a conversation between a young couple played by Cindy Williams and Frederic Forrest. They’re walking in an enormous crowd in San Francisco, suspecting they couldn’t be heard. But Caul is the best in his field, and manages to capture their discussion. Harry is supposed to give the tape to a director of a large corporation, but begins to suspect something’s wrong. He begins to examine and listen to the recording, clearing up some parts and trying to find out its meaning. I’m not going to discuss further on the plot, mostly because I’m afraid I might spoil it for you. But let me just tell you the film is downright impressive on pretty much every field. Gene Hackman deserves much praise for his performance as Harry. We soon learn about Harry’s troubled past and his devotion to religion. Hackman makes the audience really believe this thriller, and it would seem completely different without him. But who I’d have to give the most credit to is Coppola. Not many people recognize his genius, but I’m willing to say he may be my favorite director of all time. His direction in the film is magnificent, as he gives the audience clues on the story, effectively uses light to signify the intensity of the scene, and engages a terrific openning shot that’s a zoom in of a giant crowd. Coppola also wrote the story, and gives it a familiarity of a French thriller (the movie won the Cannes Film Festival the year it debuted). He plays with the camera as well as the audience’s emotions. Coppola also pays tribute to Hitchcock, the master of suspense, as well in one scene that shares a likeness to Psycho. Overall, The Conversation is a terrific thriller that surely ranks among some of the greatest of the genre. Not one scene in the movie is the slightest bit dull, as I was always on the edge of my seat. Coppola sure doesn’t disappoint in this film, and I highly recommend it. It’s definitely one of Coppola’s best. I’ll be sure to check out your post. Thanks! The Conversation is a great film. It was nominated for Best Picture right along side The Godfather: Part II. It didn’t win, but neither did Chinatown. Talk about an incredible year! Yeah, The Godfather Part II, The Conversation, and Chinatown all came out on the same year. Every one of these movies I deeply love. Thanks for commenting! Great review, I remember watching it years ago but I don’t recall that much of it. Thanks for reminding me of it as I am a fan of Coppola. It’s a great film and a very underrated one. I’m glad to see you’re a fan as well of Coppola. He’s my personal favorite director. He’s one of mine as well. I’ve reviewed the first and second part of the Godfather Trilogy on my blog. You should check them out.